Whether you're dealing with delayed onset muscle soreness after workouts (and work) or sore muscles for “no reason at all”, something's going on in your body to make you uncomfortable. In this post, we'll talk about common causes of sore muscles and how to get rid of the ache, including topical treatments, essential oils and supplements. Always remember, if pain is severe or incapacitating, please see your health care professional. This post is for informational purposes only, and is not intended to replace trained medical advice. General soreness after exertion (Delayed onset muscle soreness (DOMS)) is typically cause by micro tears in the muscle fibers. Lactic acid can also build up in the muscles, increasing irritation. Over time as the tissue rebuilds itself stronger to accommodate the activity, muscle soreness should decrease. You can read more about this at “What Causes Pain and Soreness After Exercise“. It depends. Post workout soreness in the first 72 hours is normal, but soreness that lasts more than 5 days may be a sign of overexertion or damage. Gradually increasing the intensity of your workout (or work load) can help reduce the risk of injury. A muscle cramp, is “a strong, painful contraction or tightening of a muscle that comes on suddenly and lasts from a few seconds to several minutes”. A muscle sprain is “an injury to a ligament (tissue that connects two or more bones at a joint). In a sprain, one or more ligaments is stretched or torn”. A muscle strain is an injury to a muscle or a tendon (tissue that connects muscle to bone). In a strain, a muscle or tendon is stretched or torn. Sprains and strains are generally caused by trauma (falls, twists, impacts) or overuse. Muscle soreness from cramps can usually be addressed with home care. Sprains and strains may require professional care and physical therapy. These home treatment options for sore muscles cover ongoing self care as well after workout tips to get rid of muscle pain. Start simple. Dehydration can cause muscle soreness, hydration can help prevent it and clear it. It's not a quick fix, it's a general self-care tip. Stay hydrated! Magnesium is natural muscle relaxant, and as salts, these compounds also help to pull excess fluids out of the tissues, reducing swelling. Most of us have a hard time getting enough magnesium in our diets, especially as we age. (Excess sugar consumption ties up magnesium, too.) Topical magnesium targets muscle pain by getting the magnesium directly to the sore muscles. Tried and true, a cup or two of Epsom salts (magnesium sulfate) dissolved in a warm tub of water works wonders for aching muscles. Use warm water, not hot water. For sore muscles, soak for 15 minutes or until the water has cooled, up to three times per week. Epsom salt baths are not recommended for those with health conditions such as heart problems, high blood pressure or diabetes. Magnesium oil (magnesium chloride in water) is typically applied with a spray pump bottle, which makes it easier to target on a specific area, such as a sore calf or foot. We keep a spray bottle next to the bed for nighttime leg cramps. When leg cramps hit, the first thing we reach for is the spray bottle of magnesium oil, followed by a drink of water. If we've been doing heavy labor, we'll spray on magnesium oil to prevent sore muscles and cramps. Note: Magnesium oil has a slightly tacky feel when you spray it on, and does sting a little on freshly shaved legs. (It is a salt, after all.) The leg cramp relief far outweighs any minor sting at application. 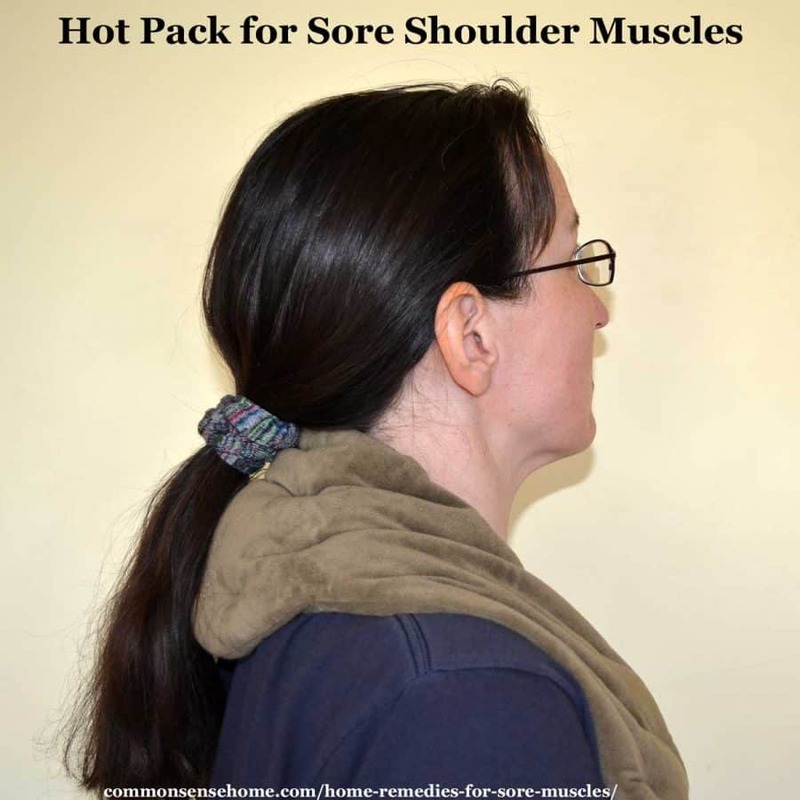 #3 – Heat or Cold – Which is Better for Sore Muscles? A warm shower or bath is a natural muscle relaxer, which can be great for tension knotted shoulders or muscles tight from overuse. While an ice pack used to be recommended for muscle sprains, research now indicates that cold slows down the body's healing process. “Nearly everyone who ices today,” says veteran athletic trainer Gary Reinl, “believes they’re doing it to prevent inflammation, reduce swelling, and control pain. But here’s the problem: Icing doesn’t prevent inflammation or swelling; it only delays it. Low levels of magnesium in the body can lead to general muscle soreness and muscle cramps. You may want to consider a magnesium supplement, but you can start by including foods that are high in magnesium in your diet. One Earth Clinic user says 1 tablespoon of blackstrap molasses in a cup of coffee each day cured his chronic muscle pain. Another way to get combine ACV and molasses is the old fashioned drink called Switchel, which was commonly used before the age of brightly colored sports drinks and juices shipped from around the world. Mix first four ingredients to blend, then add water and mix until dissolved. Chill or serve over ice, if desired. A number of essential oils and essential oils blends may be helpful for muscle pain relief. Spasms: Top recommended oils are basil, marjoram and Roman Chamomile. Tension: Try marjoram, peppermint, helichrysum, lavender or Roman Chamomile. To use an essential oil for muscle pain, add one to two drops of the essential oil into one tablespoon of a carrier oil such as fractionated coconut oil or olive oil, and apply to the affected area. Our muscles tend to want to stay doing whatever they're doing, unless we force them to change. If you're tensed up, they'll stay tensed up. Stand up, walk, run, stretch, garden – do whatever you can to be active, so you can stay active as you age. Increase blood flow = faster healing and sore muscle relief. For injuries, a new healing acronym is A.R.I.T.A. – active recovery is the answer. Don't beat the heck out of an injury, but don't avoid moving for too long. Note: Always check with your doc for severe injuries. below, you get a double benefit. Apply the rub to the affected area, and wash your hands after application. Keep the rub away from your eyes, nose and mouth – it will cause irritation. Test on a small area to make sure that it does not make you more uncomfortable instead of providing sore muscle relief. This one is not for everyone. Sometimes the best sore muscle treatment is not do anything at all. If you rest up for a couple of days, general muscle soreness due to overexertion should pass on its own. Of course, when things get busy in the garden or on the farm, rest isn't easy to come by, so do what works for you. 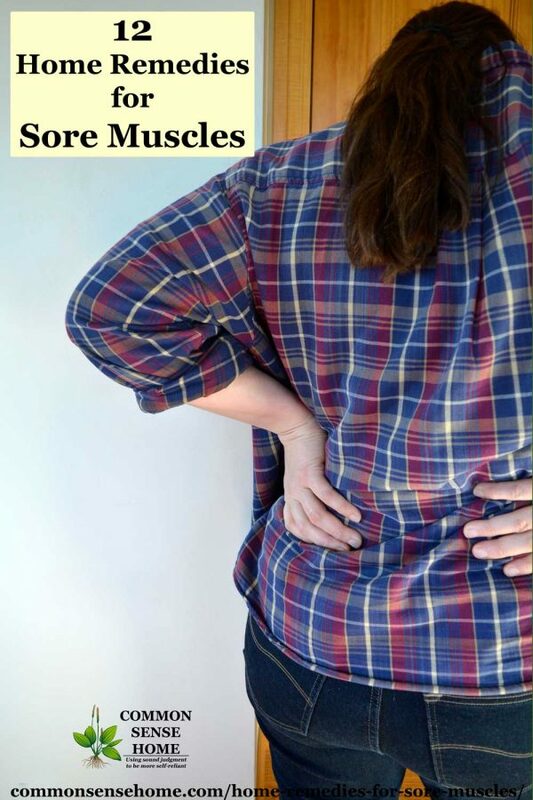 Don't sit around too long, or you may make the muscle soreness worse. Remember – Active Recovery Is The Answer. Average pain scores came in at 3.2 for those drinking the dummy mixture and 2.4 for those drinking cherry juice. Pain also peaked at 24 hours for those drinking cherry juice, but continued to increase for those on the dummy mixture for the subsequent 48 hours. The cherry juice drinkers also had better muscle strength. You can generally only find tart cherries available fresh in season or frozen, but tart cherry juice concentrate is available year round. To reduce muscle soreness, mix a tablespoon or two of apple cider vinegar in a glass of water and drink it down. Some folks drink a tablespoon straight like a shot. Still others rub the vinegar directly on the area of the sore muscle/cramp. Don't like the taste of vinegar? Try 2 teaspoons apple cider vinegar, 1 teaspoon of honey, a sprig of fresh mint and 8 to 10 ounces of cold water, well mixed. Try 2-3 tablespoons of virgin coconut oil per day in cooking and applied on foods like butter. if you want an easy way to eat more coconut oil, may I recommend some coconut oil fudge, which contains coconut oil and cocoa powder? 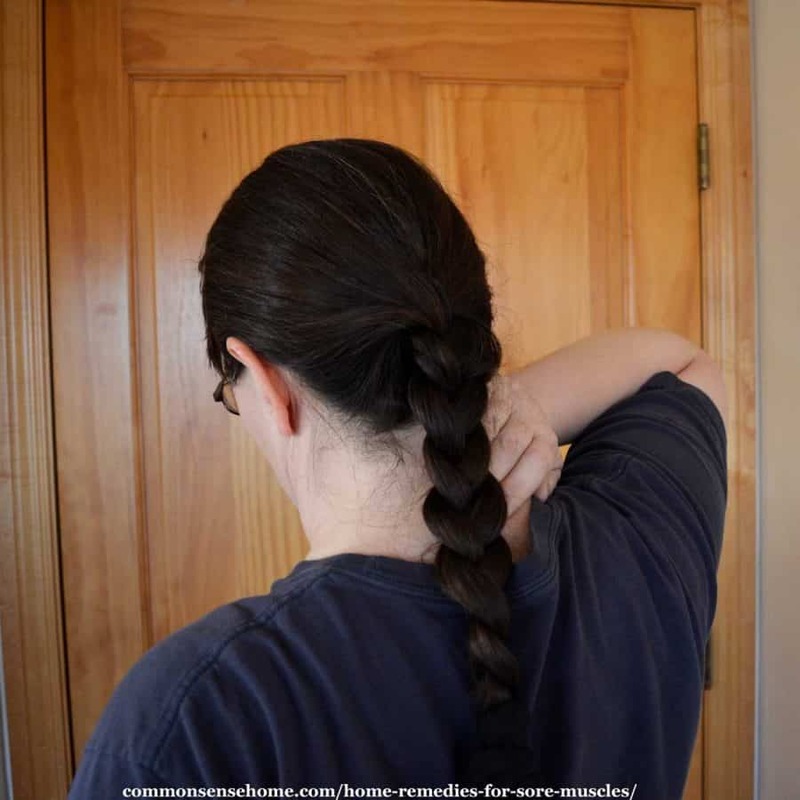 You may also enjoy the post “Natural Back Pain Relief” and other posts in the Home Remedies series. Originally written in 2013, last updated in 2019. Oh yeah! You’d think I would have remembered that one, since I live close to Door County, a major tart cherry production area. For you and your awesome email address, Andrew, I will add a cherry on top. Thank goodness I found your site!!!! So helpful. I had worked very hard physically and was so sore the next day that I could barely get out of bed. I have long known that bananas are good for this and over the years have had great success with eating lots of bananas before and after workouts. I believe it’s the high potassium content that makes the difference. Then recently, I went back to working out after a long hiatus and I lift a lot of weight when I do. I covered my whole body with arnica gel, which although a little expensive, also works like a dream. Then I thought if those two things work so amazingly well , I wonder what else I don’t know about. So I found this article, tried the recipe with the apple cider vinegar, molasses, honey, ginger and water. I also took magnesium/calcium syrup a couple of times the same day. It is very well known that day two after working out is always the most sore but by day two, I am completely healed and pain free. Thank you so much for this amazingly comprehensive and accurate article. I would have been sore for most of the week. pain came back.. A $3 hand grips cured my muscle pain problem. I’d suggest using the remedies in the post and making sure it doesn’t get worse, but it’s going to take time to heal. Have him try a rub with arnica in it. Hope he feels better. My aunt has just came back from hospital and now she say’s her neck veins are sore.Please help. I’m sorry, but I am not a medical professional, and not knowing what she was in the hospital for or having any idea of what might be causing the pain, I can’t even offer references that might be helpful. She should identify the source of the pain if possible, and then work to address the cause, not just the symptoms. Think I have found out why I have sore muscles all the time . I am going to try them to see if it really works! I have definitely noticed a difference since I added magnesium supplements to my routine. With all the gardening, I do a fair amount of lifting and digging, so it’s been a big help. my mother has sore legs .she can hardly walk,her veins are not clotted,and a massage helps but not much, i supplement her w fish oil and magnesium,she does have an extra vertabre in her lower back(spine) can u give me any advice to help her? I am not a medical provider and cannot offer specific medical advice. Each person’s situation is different and a health issue can’t be summed up in a couple of sentences. My mother had a lot of swelling in her lower legs as she aged, and ended up getting a lymphatic massage, which is different from a regular massage. This relieved much of the swelling and made it easier for her to walk. I encourage you to work with your local healers and do more research to see if you can find a solution that works for your mom. My favorite ” go to” pain relief is Arnica cream or gel. Love reading all your shared thoughts, suggestions and mostly that you are a Doterra person. So am I! I’ve been helping my boyfriend and his mom remodel their house they’re moving into, and one thing that’s helped me the most to keep going was to get a nice hot bath (I know hot dries out your skin but it feels so good!) and put lavender, peppermint, and Epsom salts in the water. Works like magic! Smells good, too, I’m sure. Epsom Salts contains a lot of magnesium, which is absorbed through the skin. Be careful not to overdo, though—too much magnesium can be toxic. 3 years ago, I always suffer from leg cramps mostly during sleeping or cold weather. I would then flex my leg muscles (the other way around) in order to ease the tension but it was really painful and I couldn’t move at all. I realized that it might be the lack of sleep/dehydration that has caused this (used to work nights). With leg and foot pain, I always enjoy having a good massage and Omega 3 Pain relief works really great! I tend to get restless leg syndrome at bedtime, but a 100 mg. tablet of magnesium stops it within minutes. At this point, I take a 100 mg. magnesium pill at bedtime as a preventative and it also helps me get to sleep. You should check a golf ball muscle roller, it really did wonders for my sore back, feels better than a massage! Thank you soooooooooooo much, these helped me a lot with my sore calve muscles from doing cartweels all weekend then haveing a hard basketball practice that made my muscles tighten up so much I could barely walk without my skin feeling like it was being so tight it might rip!!! But thank you very much!!!! Great ideas! I’m going to have to remember these for my husband. At what rate do you consume the Switchel Recipe in Sore Muscle Remedy #5? How much? How often? Every individual is different. Think of it as a sports drink alternative. Can this drink (Switchel Recipe) served to diabetic patients? Eating Well has it labeled as, “Diabetes Appropriate”. No! there are 63 grams of carbs in a quarter cup of molasses, 100 grams of carbs in half a cup of sugar! If you make this for a diabetic, please use a sugar alternative!! Very interesting info; I plan on trying many of these cures. I went from a sedentary job to a construction job, where most of my co-workers are in their 20’s. As I’m in my 40’s, it takes a lot more time to recover. I currently take Endurox, a powder mix of magnesium, potassium, calcium, ect – and was looking for natural ways to repair muscle damage; that’s how I found your site. Fixed it, and thanks for mentioning it politely. That product isn’t exactly inexpensive, is it? But the reviews are good. Here’s an amazon link for Endurox for the curious. I absolutely need this now! You’re a lifesaver, thanks. 🙂 I’m thinking about trying out the coconut oil first. Welcome, Pamela. I don’t know where you are on your journey, but I know friends have found some relief with dietary changes as well. I cut out gluten over ten years ago, plus recently I’ve eliminated most sugar and all grains. I’ve been on the latter diet for about a year and it really does help. I think a lot of pain and other common problems are caused by GMOs and glyphosate. BTW, Laurie, thanks for the heads up on cane sugar being sprayed with glyphosate. I occasionally cave in and have some ordinary milk chocolate, but I’ll be thinking twice the next time I get a craving. I wish I didn’t have to share the news about more glyphosate contamination, but it’s everywhere. I always use a golf ball muscle roller to massage my muscles and take biosteel supplements which really helps my muscles recover better than anything else i have ever tried. What do you think? Can you recommend a good magnesium, calcium, potassium supplement? Look for a calcium and magnesium supplement that contains magnesium citrate, magnesium chloride, magnesium aspartate or magnesium lactate, instead of magnesium sulfate or magnesium oxide. These forms of magnesium dissolve better in liquid, making it likely you’ll absorb more of the magnesium contained in your supplement, according to the Office of Dietary Supplements. Of the two main types of calcium found in supplements, calcium citrate is more easily absorbed. Calcium carbonate can’t be absorbed unless you’ve got stomach acid available, so if you choose a supplement containing this type of calcium, you’ll need to take it with food to improve absorption. Calcium citrate also tends to cause fewer side effects than calcium carbonate, such as bloating, gas and constipation. They also recommend twice as much calcium as magnesium, and no more than 500 milligrams of calcium per pill. High potassium foods include beans, dark leafy greens, potatoes, squash, yogurt, fish, avocados, mushrooms, and bananas. I’m bookmarking this…thanks for sharing! Hello Laurie, most of these are great tips, and I will try them. Sorry, I have to disagree with # 11 ‘rest’ You could simply say don’t over do it. It contradicts #8 movement, and rest is the worst thing one can do sometimes. My back goes completely out about every 2 years. I had a chiropractor that was also a physical therapist. After an adjustment he said the worst thing I can do is to lay down. I told him I had to go to a huge hardware store for plumbing parts and he said go, get a cart, lean on it and walk very slowly around the whole store. He also gave me a list of slow leg lifts (lying flat on a bed) and stretches which help to this day. Now it has been 6 years since it has gone out. Every injury is different, mine is due to being rolled in car wrecks and falling off my first horse on my tailbone. The slow leg stretches at night and in the morning help keep me functioning. If pain is severe or incapacitating, please see a trained health care professional. Given that I am not a certified sports therapist and I can’t virtually examine your arm for damage that would be causing this pain, I’m afraid I can’t directly help you. It’s really, really much safer if you see a real human on this problem – not a virtual one – just in case you have some damage or something out of alignment that you are hurting by doing what you’re doing. Pain like that is not normal or typical for most people. Not getting this checked out now could lead to serious problems down the road. The cold air may have made your muscles tighter, causing soreness. If pain is severe, please see a health care provider. If you are just sore, try any of the remedies in the post, especially warmth and massage to release the tightness. my wife has bad pains and circulation in her legs she was using suboxone for many years and now she is off this for some time now .Can you think of anything to help these pains .she does not want to use any medication that is not natural or that is not good for her please help us she is really trying hard. If pain is severe or incapacitating, please see a trained healthcare professional. ok thanks for getting back with me. that is the direction i would take also we will keep trying things. Good luck. I know it’s hard to feel lousy. Very interesting remedies – thank you. My son has been doing some manual labour the last few days and a few more to go. His hands are quite painful from the unaccustomed work (! ), in particular the heels of the hand below the thumbs are quite swollen. What would you recommend ? Soaking his hands in an Epsom salt soak should help take down the swelling, along with the molasses and/or vinegar taken internally. For spot inflammation like that (where it’s probably as much bruising as muscle soreness), I also like arnica gel, which you can order online (amazon link to arnica gel) or find in many health food stores/natural pharmacies. Totally refused to drink vinegar !! Definitely bruising more than muscle soreness, so got him to soak them in a vinegar solution for a short while, (these youngsters, just too impatient). I had arnica gel so he massaged that in regularly and found it very effective. I must remember to get epsom salts when next in the UK, have never found it here in France. I have found Epsom salts at the local pharmacy and pharmacy sections of general merchandise stores, but the best local prices I’ve found have been at the farm supply store. Epsom salts are also good for treating animals, too. My mom has been adamant about drinking apple cider vinegar for a while now, and she said that it has helped reduce soreness after workouts. I’ll have to give it a try! Thank you for sharing the tips. Please see a trained healthcare professional if pain is chronic or severe. If pain is mild and inconsistent try something or multiple somethings from the list. Coconut water has more potassium than a banana, though it’s not as tasty. I add coconut water, tart cherry juice & ginger to my nightly vitamin & fiber shake, sometimes I throw in some apple cider vinegar too. When I do that my muscle pain seems to improve. Sounds like a potent combination that would help you poop well, too. My fiance just started construction in early august. He works from 6-3, Monday through Friday. He comes home everyday beat up and can barely move. He complains about aching muscles and his legs locking up the most. I hate to see him like this. I don’t know what to try first or what is best for his condition. I’d start with the magnesium drink (Natural Calm) and an Epsom salt soak if he has time for it. Make sure he stays hydrated, too. Laurie, I think you should add red beets to the list . I’m 77 and have been eating an oz or 2 every day for the last 3 or 4 years and have very little joint or muscle pain , even after elliptical and treadmill, or swimming for an hour 4 or 5 days a week. I started out by cooking them and peeling them before eating. Now I scrub them and cut them into strips- skin and all- and eat them raw. The sweeter ones taste almost like carrots. Interesting. Thanks for sharing, Peter. Beets are high in antioxidants, which fight inflammation, and nitrates, which are good for heart health. Very useful. But Ginger juice comes in high recommended based on experience. I hope you find a combination that works for you. Which one would work the best on leg pain and soreness??? Every person is different, so it’s hard to say what would work best. #1 and #3 are our “go tos” for quick relief. 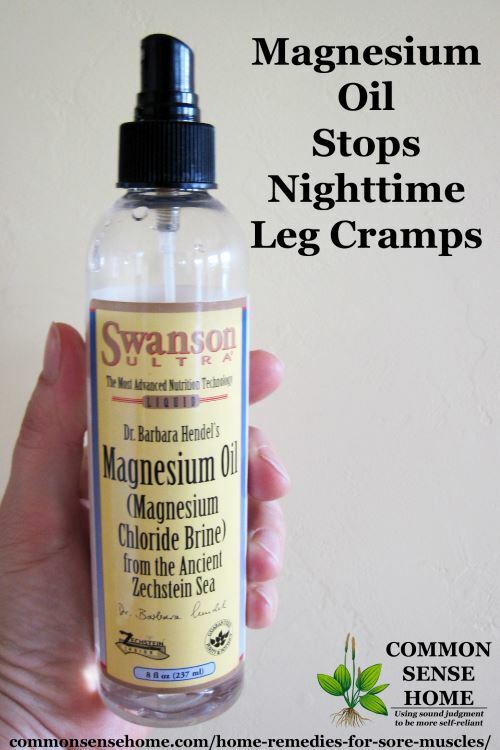 Magnesium oil is also good for stopping nighttime leg cramps. Goldenrod oil/salve works great too. Thanks, Rachel. Do you have a recipe that you prefer? I go and pick some goldenrod and use the leaves and stems for the oil and dry the flowers for teas to help with seasonal allergies. For the salve, fill a glass jar half way with chopped leaves and stems, fill to an inch of the top with oil of choice. I do a warm infusion by placing a folded hand towel in the bottom of a crock pot, place jar with lid on it on towel, fill half way up jar with water, put lid on pot, put on low and leave for 24-48 hours making sure to keep water level up. When finished, strain (squeesing to get all oil out, let sit for about 15 min. to seperate any water from oil, pour out oil, careful not to get any water in, add bees wax to desired thickness (to test put a spoon in freeze, when cold dip into warm oil. It will harden and you can feel how hard it will be). For the flowers, pick ones that are not fully open as they will continue to blossem as they dry (if they are fully open, they will develop the seeds that are like tiny dandelion puffs), hang or lay flat to dry in a cool dark place. my father aged 57, have stiffness in his mussels. he had hard worked in his his whole life like exercise etc beyond of this he also take too much stress on the other hand he cant take a deep sleep i googled a lot about and found the reason is the increase of cartisol level in body……..ill be glade if you please guide me that what will i do for his help????? There can be many reasons for increased cortisol levels, including lack of sleep itself. Generally a good place to start is with looking at stress and diet. Great list! I personally found magnesium supplementation was a major player in helping me overcome muscle pain and cramps etc. I used magnesium glycinate, which I believe is readily bio-available. also did a lot for my anxiety too. Also, had a lot of success with foam rolling to break up dense areas of tissue in the muscles. I had a hip issue for many years, and foam rolling has essentially cured it. Soft tissue work can be a really useful thing. Try the Epsom salt soak and other remedies listed in the post. Don’t forget to keep gently moving, even though you are sore. The blood flow helps to speed healing. I’ve recently heard rumors of pickle juice being effective for muscle pain but haven’t been able to nail down the specifics. Any news or opinions regarding that? I’m not sure if you’re supposed to drink it or use it as a rub! I’d guess drink it, for the vinegar and salt content? I walk and jog 4-5 times per week in the gym along with some light weight training. My range of motion has dramatically decreased when I walk and get out of bed each day due to pain and sore stiff muscles. Where should I look for these magnesium supplements? Is there a diet plan that will help? Every person is different, so the best option would be for your to work with a nutritional counselor or trainer to develop a personalized plan. Magnesium Glycinate is one of the most easily absorbed forms of oral magnesium. (You can order it online here or find it at a health food store or other online vendor.) Epsom salt baths are another easy and inexpensive way to get more magnesium into your body. You should be able to find Epsom salt at any drugstore. Article was very helpful. I noticed a couple things I use that have helped me over the years. Baking soda and water, 1 tsp per 8 oz. glass of water. It tastes like you’re drinking the ocean, but once a day keeps me nimble and ache-free. I also love the tried and true Absorbine Jr. It’s menthol and a few other natural things. I even let my 11 year-old use it for sore muscles from playing basesball, soccer and football. Thanks for sharing your sore muscle remedies, Sydney. If you are regularly straining to defecate, that can put a lot of strain on the area around your waist. How high is your toilet? Squatting is a more natural position for defecation, so adjusting your position when you poop may help. Note, there are also some digestive disorders and muscular diseases that can affect defecation, so please see a trained healthcare provider if pain or discomfort is severe or persistent. Material on the website is for general information only. I experienced the same, but I went out of work for a week or so, stayed more on my bed relaxing and sleeping, got hydrate with just water, no fried, packaged or other processed food, it disappeared. Note: being in Nigeria, I first treated malaria.